Gabby Kline scores inside during the second quarter against Trotwood. Kaitlyn McCrary scores a layup during the first half to give Northmont a 21-15 lead. Makayla Cooper scores from 3-point range against Trotwood. 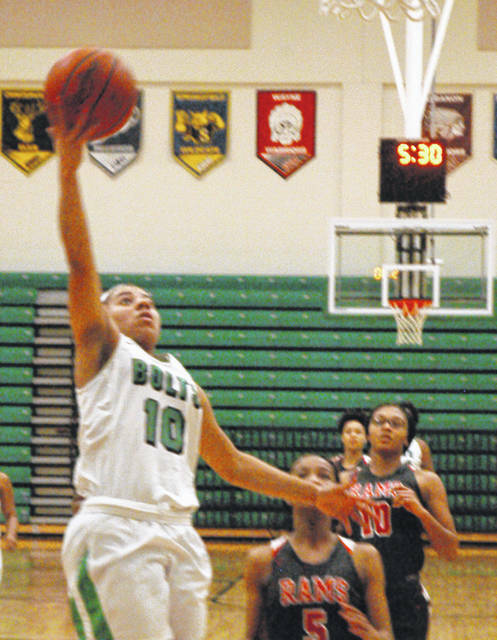 CLAYTON — Few expected Northmont to give Trotwood-Madison much of a battle Monday night. The Lady Runnin’ Rams had won 10 straight and were undefeated in conference play entering the game while Northmont came into the game one game under .500. After T-M took a 4-0 lead the Lady Bolts fought back and took control of the game in the first quarter. Tied at 10 Makayla Cooper buried a 3-pointer, drew a foul and sank the bonus shot to give Northmont a 14-10 lead and Northmont held a 17-11 advantage by quarter’s end. Trotwood pulled to within a basket in the second period but Northmont kept making shots. Kaitlyn McCrary, who led the Lady Bolts with 16 points, scored on consecutive possessions, Gabby Kline got open underneath and Cooper scored a jump shot and a pair of free throws to give the Lady Bolts a 29-21 lead. By halftime the Lady Runnin’ Rams closed the gap to 32-31. Northmont led until late in the third quarter. Sha’mya Leigh scored on back-to-back possessions and Quantaijah Huffman scored in the closing seconds to give T-M a 41-38 advantage entering the fourth quarter. Northmont never recovered as Trotwood went on to post its 11th straight victory 55-47. Leigh, who scored 14 points in the second quarter and led T-M with 30 points, scored seven in the final period on a pair of baskets and three free throws. 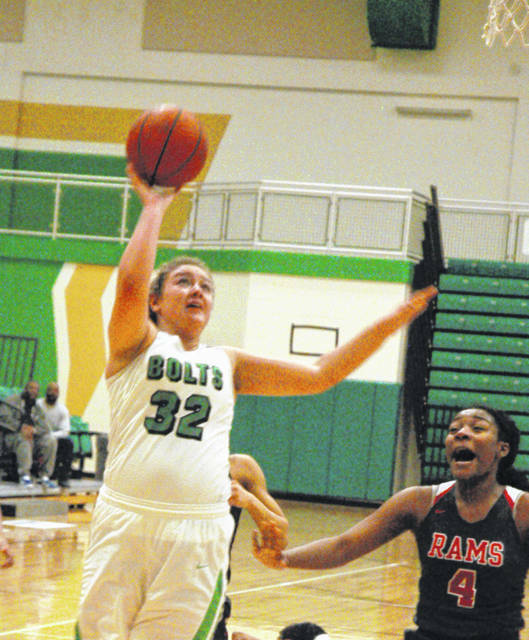 The Lady Bolts pulled to within three points on a pair of free throws by Shalaya Heath with 3:43 remaining, but from there Northmont only managed to score one more point on a free throw by Jacquel Bronaugh. Trotwood slowed the game down and passed the ball trying to force Northmont to commit fouls. The slow down tactic nearly backfired when the Lady Runnin’ Rams turned the ball over while leading 51-47, but Northmont missed a shot inside and with time waning was finally forced to start committing fouls. T-M converted four of six from the charity stripe down the stretch to preserve the victory. Northmont only managed to score six points the entire third quarter, but also limited Trotwood to 10 points with tough defensive play. A few breaks here and there and the outcome might have been different. The Lady Bolts travel to Lebanon on Wednesday before returning home to host Carroll on Monday. 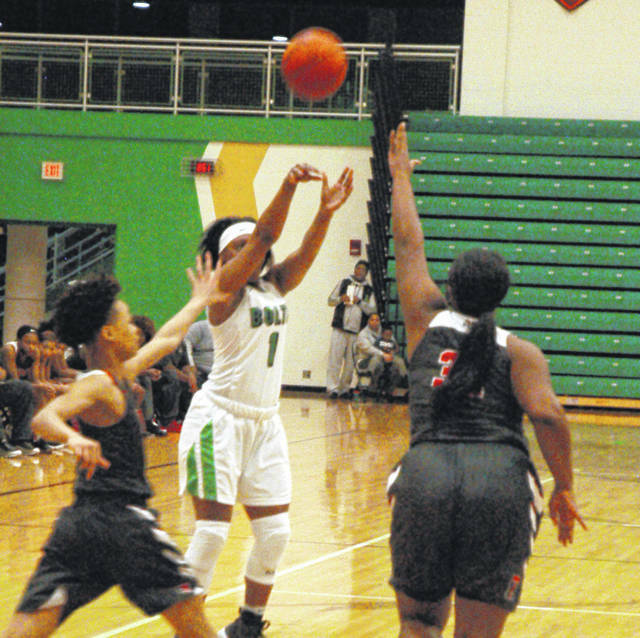 Trotwood: Quantaijah Huffman 4-1-9, Essence Thornton 1-0-2, Goddess McIntyre 0-1-1, Sha’mya Leigh 8-13-30, Heaven Gooden 1-2-4, Amya Dixie 1-1-3, Korryn Millerton 3-0-6. Totals: 18-18-55. Northmont: Makayla Cooper 3-3-11, Kaitlyn McCrary 7-1-16, Amari Bradford 1-0-2, Kamorah Rhylick 0-2-2, Shalaya Heath 3-2-10, Gabby KIine 1-1-3, Jacquel Bronaugh 1-1-3. Totals: 16-10-47. 3-point goals: Trotwood-Madison 1 (Leigh); Northmont 5 (Cooper 2, Heath 2, McCrary). Records: Trotwood 14-2, Northmont 8-10.